A Little QR Code Help So You Can Join in the POETRY FUN! Again this year, I'll be writing a poem a day during the month of April. Yes, it's probably cheating to love a series when there's only one book out so far. But I'm willing to stick my neck out for Tugg and Teeny. There are three short stories in this book, and they are all art-themed. In the first story, Teeny wants to become a musician. Tugg didn't buy her expensive lessons, he made sure she discovered a stick with holes in it, encouraged her to blow in it to see what happened, and then waited patiently as "her squeaks turned into peeps, and the peeps turned into tweets and toodles." Tugg is just as patient when Teeny wants to become an artist (Violet the Warthog helps out with this venture), and when Teeny wants to be a poet. 1. Tugg and Teeny are a great pair of characters. Elephant and Piggie great. Frog and Toad great. Henry and Mudge great. 2. They call each other "Monkeyface" and "Tuggboat." This post is the first in a SERIES of Wednesday posts about new/recent books in some of my favorite series. 1. I fall in love with characters when I read, and with a series, I get to revisit them in book after book. 2. I appreciate the way an author can keep enough things the same and at the same time, change just enough in each successive book in a series to keep me reading. 3. Other people collect baseball cards or beanie babies. I read all the books in a series as a readerly way of collecting. It is Chepito's first day of school, but before the day begins, he walks around town and finds lots of people reading. To each one he asks, "What are you doing?". He then follows up with the questions, "Why?". Each reader is reading something different--from a newspaper, to the comics, to a manual, to a fashion magazine. And each reader has a different reason for reading. The story ends with Chepito going to school and discovering the joy of books. This simple story will start lots of great conversations around books and the reasons we read. The repeated phrases and predictable storyline make it perfect for young readers. An added bonus for our family was to discover that the author, Elisa Amado is a Guatemalan-born author and translator. If you have not made time to read Patrick Carman's multimedia books, I would highly suggest doing so. Patrick Carman is committed to creating multimedia books that hook readers and keep them reading. He has really done some amazing work and he has created some great stories that use so many types of media. The first book I read was SKELETON CREEK . I reviewed it on the blog right away and was excited to see how seamlessly Carman had integrated the various forms of media. This series has been hugely popular in the library since its publication. The newer series that Carman created is the TRACKERS series. This one was more of a spy novel and I reviewed the first book in the series on the blog last year. Patrick Carman's new project is very exciting. He has created a series of short stories called 3:15. These stories require that you LISTEN, READ AND WATCH. This 3:15 series is published as an APP. 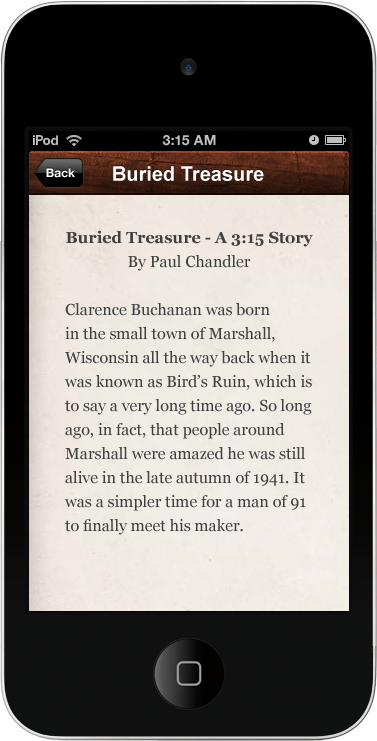 The first episode, "Buried Treasure" has been released. There is a new episode due to be released every 2 weeks through summer. Then Season 2 Begins with more episodes. If you enjoyed Jon Scieszka's EXQUISITE CORPSE ADVENTURE creation, where you wait for a new online episode to be released, this follows a similar idea. One big difference in this and The Exquisite Corpse is that each episode in 3:15 is a stand alone story. The first episode is free and the second episode of 3:15 is due out tomorrow--March 29. It is called, "Reflecting Pool". It sounds like all of the stories will be published in a book this coming fall from Scholastic. 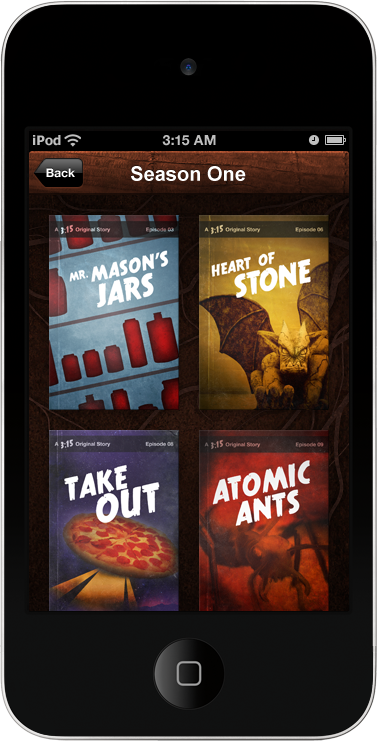 Lots of ways for kids to discover these stories. I love that about Carman-he seems to be committed to giving kids many ways into reading. leads the reader to the video ending. I spent some time with the first episode, "Buried Treasure" and really enjoyed it. I also handed it to my 11 year old daughter when I was finished it and she thoroughly enjoyed it and wondered when the next episode was due out. Here is how it works. When you get to the app on the ipod/iphone, you have 3 things to do. First, you LISTEN to the set up of the story told by a narrator. Then you READ for about 10 minutes. The text is about 22 ipod size pages and this part tells the bulk of the story. When you are finished with the text, you go to WATCH and view the video that tells the ending to the story. I love this. When I first read SKELETON CREEK, the only part that bothered me was moving from book to computer. I hated putting my book down to get to the computer. But Patrick Carman has perfected all of this and has figured out how to put all parts of the book into an app so you can experience each on the ipod or ipad. These stories are a bit scary. Ghost stories. I have had difficulty lately finding enough "Scary Stories" for kids in the library who love them. 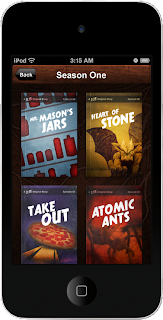 These will definitely appeal to kids who love the SCARY STORIES TO TELL IN THE DARK series and authors like Mary Downing Hahn . I think there are so many more possibilities for reading today and I am so glad that Patrick Carman has committed to this work with Multimedia. He has a great video on his website that better explains all of this called, How a Multimedia Book Works. He also has a great clip on his thinking about Books and Tech. Patrick Carman really seems to have discovered new possibilities for storytelling. Whether you are already a fan of his work or not (I am, can you tell? ), check out his new series of apps, 3:15. I am already looking forward to Episode 2 which is available on March 29. I have been using Goodreads since January pretty regularly. I use it to log my own reading and to pay attention to what friends are reading. I am finding that this is a huge resource for finding great new books. When I get an update, I check for books my friends have added and I keep my eyes open for those books that people give a 4 or 5 rating too. I add all of those to my list. Last week, this was exactly how I discovered the book CAN WE SAVE THE TIGER? by Martin Jenkins. Donalyn Miller had read it and given it a high rating. Since I am always looking for good nonfiction for children, I knew this was one I had to read. I should have noticed that it was written by the author of another of my favorite nonfiction books, THE EMPEROR'S EGG but I didn't right away. WOW! This book is amazing. There are so many reasons I like it. First of all, it is a great nonfiction narrative--one that is meant to be read cover to cover. One of the things that has me concerned lately, about kids' nonfiction reading, is the fact that so much skimming and scanning, without ever reading whole texts, is happening. So, finding books that are meant to be read from cover to cover has been a goal for me. Also, I am always looking for great nonfiction read alouds. This one BEGS to be read aloud. As a matter of fact, I made my family listen to much of it once I realized how amazing it was. And, yes, they loved it too. And, this is a great mentor text for kids who are writing nonfiction. The writing is powerful and every line is crafted well. A great model for nonfiction writers. But most importantly, this book taught me so much about endangered animals. The author pulled me in from the first page and told me stories about animals. He helped me understand the complexity of the many reasons animals become extinct. And he shared ways people have helped and are now trying to help the animals who are in danger. No matter how much you know about a topic like this, there is so much complexity to the issues and Jenkins does a great job at sharing many of those. This book is accessible to kids and I am confident they will love it. It is packed with information embedded in stories that help you care deeply about each animal discussed. The illustrations are mostly sketches that add powerful images to the text. The illustrations show the beauty of the animals as well as the dangers they face. At the end of the book are web resources to go to for more information. ...Speaking of Poetry Month, I'm cooking up an idea that involves, of course, poetry (writing or finding), along with a little bit of "tag, you're it," and a little bit of treasure hunt...using QR codes. If you're interested in playing along, let me know in the comments or via our blog email (see sidebar). Now let's get on with the roundup for this week! Leave your link in the comments, and I'll round them up throughout the day. Happy Friday! Heidi is "making lemonade" today at My Juicy Little Universe with Taylor Mali and "What Teachers Make." Charles has a gift for a troubled world at Father Goose -- "Be Still in the World." Ben continues his Women's History Month countdown at The Small Nouns with a spotlight on Elizabeth Bishop. Speaking of Women's History Month, Tara, at A Teaching Life, has a poem in remembrance of the 100th anniversary of the Triangle Shirtwaist Fire. April, at Teaching Authors, shares a thank you poem for an amazing doll and an amazing author visit. Amy has poem #359, "Eating Reading," at The Poem Farm, the final poem in her series of poems about books and reading and words, and the 360th poem in her poem-a-day-FOR-A-YEAR project that started last year on April 1! At The Opposite of Indifference, Tabatha has a poem in honor of her grandmother. It will make you smile! Marjorie's sharing a call for original haiku to benefit the Artists Help Japan Earthquake and Tsunami Fund. Check it out at Paper Tigers. Then submit your haiku. Travis has a spine poem mystery thriller at 100 Scope Notes, and he invites you to submit yours for his Poetry Month Gallery. Blythe combines buttons, words, rain, indexing, and poetry in her post, "At the Storm Door," at Blythe Woolston. Ruth, at There is no such thing as a God-forsaken town, shares a sutra (check her post for the definition) that will encourage you to live abundantly. 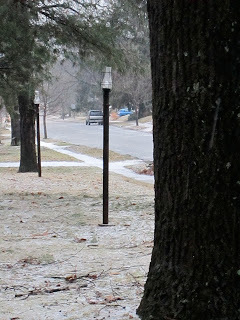 Toby has an original poem and a photo to match at the Writer's Armchair, "After Late Snow." Come on, Spring! Get here already!! Diane's Poetry Friday offerings are "Little Ships" at Random Noodling, "Wild Geese Among the Reeds" at Kurious Kitty, a quote by Jakushitsu (author of "Wild Geese Among the Reeds") at Kurious K's Kwotes, and Emily Dickinson at The Write Sisters. Laura, aka Author Amok, shares a rich, green, warm, grassy (make-believe) poem by Maryland poet-in-the-schools Vonnie Winslow Crist. David shares a very silly, very punny original poem, inspired by Joyce Kilmer's "Trees" at Fomagrams. Pentimento sends out a haiku by Issa to our suffering world. At Carol's Corner, Carol's poem choice this week,"What to Remember When Waking" will get you thinking about accidents and possibilities. Laura, at Writing the World for Kids, shares a poem from a new book of elephant poems by Tracy Vaughn Zimmer. The week's 15 Words or Less Poems are here. Sara's original poem grew out of Laura Purdie Salas' (see above) and Susan Taylor Brown's weekly online poetry book club. Sara's commercial for the book club and her poem are at Read, Write, Believe. Jama's got a veritable smorgasbord for us today at jama rattigan's alphabet soup: a spine poem, a kitchen utensil poem, drool-worthy photos, and news about her second annual Alphabet Soup Poetry Potluck for National Poetry Month. Debbie Diller shares a lullaby by Christina Rossetti this week. Linda's got a review of the first book in J. Patrick Lewis' new series, Tugg and Teeny, at Write Time. The folks at the Stenhouse Blog (Bill, was that you?) have picked the perfect poem for spring, featuring optimists, old women, and dogs. Katie, at Secrets and Sharing Soda, has a review of The Tree That Time Built and the cd that accompanies the book. For a moment of meditation, go visit a wrung sponge: beautiful images of cherry blossoms and some of Andi's favorite Basho cherry blossom haiku await you there. Carol, at Rasco From RIF, reminds us that it's cherry blossom time in Washington, D.C., too! She's got a haiku and some gorgeous pictures to remind us of the hope spring brings and to encourage us to continue to support the rebuilding of Japan. Kelly takes us to Germany for the first violets of spring in German, English (her own translation!! ), and song at Writing and Ruminating. Don't miss the chance to bid on her auction for the Kidlit4Japan fundraiser. At Wild Rose Reader, Elaine riffs on crocuses with 5 poems in 5 different forms! At Blue Rose Girls, she has 4 poems in 4 different forms about silkworm cocoons and pupae, along with links and a video about silk-making. Fascinating! Jeannine, at Views from a Windowseat, shares her thoughts about a new novel in verse (Orchards, by Holly Thompson) that is set mostly in Japan. At The Blog With the Shockingly Clever Title (I love typing that! ), Karen shares "Prayer for Our Daughters" by Mark Jarman. At Picture Books & Pirouettes, Kerry has a "Read it. Move it. Share it." post based on Dr. Seuss' My Many Colored Days. She combines the poetry in Seuss' book with creative movement for wee ones. In the book Janet shares, Where is Spring?, a kite is searching for signs of spring. Find out more at All About Books. Jenny, at Bibio File, has an original haiku about the cherry blossoms in D.C. during her second favorite time of year there. Loree Griffin Burns has two Taylor Mali video entries for Poetry Friday this week at A Life in Books. Sylvia, at Poetry For Children, has exciting new information about her (and Janet Wong's) e-book poetry project PoetryTagTime. Martha Calderaro shares a silly grammar poem today -- "The Grammar Lesson" by Steve Kowit. Carlie, at Twinkling Along, has an original (and hopeful) spring tanka. Jone, at Check It Out, gives us a sneak peek at some student poems like the ones she'll be sending out on poetry postcards. Joyce, at Musings, has an original haiku today. Sarah, at Books, Dogs and Frogs, has some Edward Lear silliness for us today. Sherry, at Semicolon, suggests the poetry and sermons of John Donne for our "lenten edification." At the blog Learning to Let Go, you can read a poem about hawthorn in spring in Ireland. 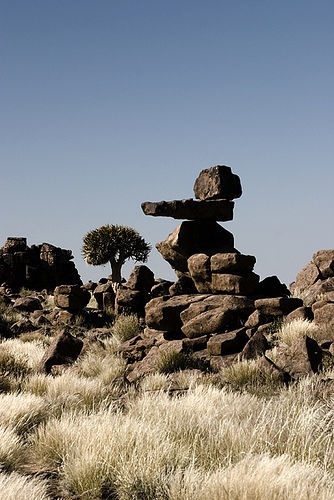 How many times have Franki and I written about balance here? Too numerous to count, right? Well, we decided to LISTEN to ourselves and ACT upon what we heard. We're taking a blog vacation this coming week -- our spring break. We took our first blog vacation last year at this time, and it seems like the kind of thing we'd like to do for ourselves on a yearly basis. See you next Friday for the Poetry Friday Roundup. Until then, Happy Spring! Happy Balancing! "All things counter, original, spare, strange..."
I made a Toon out of it. "He fathers-forth whose beauty is past change..."
I've written a parody of it that I thought I had shared, but I can't find it. Maybe next week! Andy has the Poetry Friday roundup this week at a wrung sponge. Next week, the roundup will be here! Check out Dublin's Blogging Irish Dance Team. It's been two years since we made our famous video, but we're all still goin' strong. Dancin' up a storm and livin' the grand life in the Land of Shamrocks (Ohio version). We notice words and talk about words (and, of course, "use our words") all day every day. But on Wednesday, we set aside our regular writing workshop for...Wooorrrrrrddddd Wednesday! Sometimes we work on Spelling City. I have gathered lots of lists of words (from -at and -ing words to Velma's words in The Small Adventure of Popeye and Elvis ...this would be an example of real-world differentiation) and on Spelling City, students can pretest, play games, write sentences and posttest. I've written about how I use the SmartBoard and my classroom mirror for word study. Recently, I took a bunch of juicy words (from one of the Thea Stilton books) off the mirror and put them on the SmartBoard. We practiced finding the root word and the affixes, and the Thea reader stood a few inches taller because HER juicy words helped us learn. We have lots of favorite word games to play on the iPod Touches on Word Wednesday. (You might guess that this is a favorite activity for Word Wednesday!) We like Wurdle, Chicktionary, and Bookworm. Soon we'll have Words With Friends (a current obsession of mine). We'll use the "Pass and Play" feature. What are your favorite ways to celebrate words, collect words, play with words, and learn words -- on your own, or with your students? Last week, we had our 2nd MOCK NEWBERY CLUB Meeting during lunch. This is a group of 14 fourth graders who have committed to reading new 2011 novels during the year. At this point in the year, we are merely reading lots of the new books as they are coming out. I have 1-2 copies of several titles and ARCs. Single readers are reading the books and then recommending them (or not) via meetings and an in district wiki that we have set up. It is a fun time of year because there are lots of new, good books being released. Below is a list of the 2011 novels that I've read so far this year that are well worth reading. NO PASSENGERS BEYOND THIS POINT by Gennifer Choldenko is a great science fiction/fantasy writer. The story is different from Choldenko's other books (which I have also loved). Three children find out that their mother has lost their home and are sent to live with an uncle until their mother can join them. This story is of their journey. In the process, they learn about family, and home and what is important. I don't want to give too much away about this book, but the ending makes me want to go back and reread. You can hear Gennifer Choldenko talk about her writing and this new book in this video. I am hoping that CLARA LEE AND THE APPLE PIE DREAM by Jenny Han is the first in a series. I haven't heard whether or not it is, but it would be nice. Clara Lee is a great character and this is the story of her dream to become queen at the local Apple Blossom Festival. However, she is made to feel that she cannot win because she is Koren-American. But Clara Lee is feeling lucky and has her hopes up. This is a great story and a great transitional chapter book--a great length and a great story for 2-4th graders. The new series, The Incorrigible Children by Maryrose Wood, is a new favorite for me. I loved the 2nd book in the series, THE INCORRIGIBLE CHILDREN OF ASHTON PLACE: THE HIDDEN GALLERY . This is the story of 3 children who were found in the woods, presumably raised by wolves. It is the story of their nanny, Miss Lumley, (who definitely deserves a spot on our 100+ Cool Teachers list) and their adventures. If you have read the first book, you will love this one too. If you haven't read either, make time to read them both soon! My thinking is that they will be great read alouds for early in the school year. I reviewed OKAY FOR NOW by Gary Schmidt last month. This is a GREAT read that I highly recommend. You can read my review here. BLESS THIS MOUSE is a new book by one of my favorite authors, Lois Lowry. This is a different kind of book for her. It is an early chapter book about a community of mice that lives in a church. There are dangers in the church. This is a nice, quiet story. Love Lois Lowry's letter to readers on the Amazon page about her idea for this book. My favorite new dog story is A DOG'S WAY HOME by Bonnie Pyron. Abby and Tam are inseparable. But then tragedy strikes and they are separated and they have trouble moving on without each other. This story is told in two parts--Abby's and Tam's. As much as this book is like other dog stories, the dog's perspective makes it unique. I loved both Abby and Tam within the first few pages because I understood them both so well, and so quickly. I don't want to give away a lot before you read it, but although it is a quick read, it is hard at points because Abby and Tam are both in such pain. A great read, especially for dog lovers. Right now, I am reading SMALL PERSONS WITH WINGS by Ellen Booraem. I am not very far along but am loving it. I picked it up after Betsy Bird's review. So far, I am loving it. The character's voice and the writing is quite fun, as is the whole premise of the book. Can't wait to finish it. I do so love this time of year when there are so many great books of the new year! Sometimes I realize that I take for granted all of the great Ohio authors we have. We are lucky to live in a state with such great children's authors. Will Hillenbrand is one of those great Ohio authors. At Cover to Cover last week, I saw his new book, MOTHER GOOSE PICTURE PUZZLES , in the window. What a treat of a book! This book is a rebus type book-but a little more than that. For each of 20 classic Mother Goose rhymes, pictures replace some of the words. So readers can guess the word. For readers who need a bit of help, there are clues in each picture to help out. (And for readers who are not quite sure about the meaning of things like a "fiddle" or "silver bells", the illustrations will help them understand. Hillenbrand's illustration are a great match for these classic rhymes. Each rhyme is placed on a two-page spread with a great matching illustration. In the case where 2 rhymes are on a single spread, the illustrations work together. Hillenbrand is really brilliant in this book. The book is a little larger than a typical picture books which makes it a great choice for sharing. I can see buying lots of these for several reasons. It would make a GREAT baby gift. A new baby could enjoy this book for years. It would also be great in a primary classroom. I think because of the rebus aspect, older kids would enjoy it too. I plan to share it with all students when we focus a bit on poetry in April. I am pretty sure they will all love it. The last three days snow has fallen. twenty since the end of December. over our heads and out above the tree line. current moving beneath its blue surface. toward something warmer, something better. This is a hard time of year for people who are sick of winter and for teachers, and this year seems harder than usual. These lines speak to me right now: "...there's nothing/to be done except to make it to the top..." and "Like the owl, our breath rises, drifts/towards something warmer, something better." 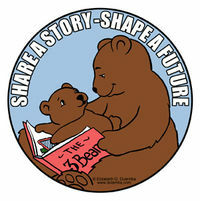 Welcome to Thursday's edition of Share a Story - Shape a Future. Today's topic is Love of Reading vs. Homework. We all worry about balancing our children's reading lives. We want them to have choice and to become lifelong readers. As teachers, we work hard to make school reading authentic, but even with the best intentions, sometimes children get the wrong messages about school vs. home reading. As parents, many of us have seen the impact on the messages our students get about reading being different at school and at home. Years ago, I wrote an article about shopping with my daughter, Ana, who was then 6 years old. I loved watching her book choices and wished she could have the same freedom choosing books at school. (You can access the article at Choice Literacy.) We have also all heard of stories of the home reading bag where students are required to read books at their "level" instead of books they love. Lisa Koch wrote an article about the impact this home reading had on her son in, "My Son, Clark Kent", also at Choice Literacy. As a classroom teacher, I have always struggled with reading homework. I know that when reading is assigned, it feels like a chore to me, I don't like it and I go through the motions of reading and I don't want that for my students. But I also know that the amount of reading kids do, makes a difference. And as a parent, I know that my kids read at home when their teachers expect them to. I want my students to read at home because I know that it is an important way for them to grow as readers but I don't want to assign it. What's a teacher to do? I see huge potential in social networking tools. If students see a purpose to their home reading, if we have tools that can extend the conversation beyond the school walls, home reading becomes more authentic. Many teachers I know are using blogs, wikis and social networking sites such as Shelfari to give students a place to talk with others about their home reading. Rather than keep a home reading log for the teacher, the students can converse with others about their reading. At AM Literacy Learning, Ann Marie Corgill interviews her eight-year-old nephew, Jack, about his reading. Sharon Taberski talks about "Reading for the Fun of It" on her blog, It's All About Comprehension. At Catching Readers Before They Fall, Pat and Katie share a post called "Puppies or NASA?" Cathy at Reflect and Refine tackles the issue of take home books and supporting students in choosing Just Right books in a variety of ways in her post, Real Reading. Deb Frazier at Primary Perspective show us how a tool like VoiceThread can help create lifelong readers in her post "Reading Like Readers -- Naturally." Katie DiCesare at Creative Literacy explores "Connected Learning Instead of Homework." Patrick Allen at All-en-A-Day's Work reflects on those mundane tasks he has asked children to do over the years in his post, "Repent... At Reading Homework Taketh Another Look..."
At Educating Alice, Monica has a post about some recent homework that demonstrated a love of reading in "In the Classroom: Book Reviews." Carol, at Carol's Corner, is thinking hard about Reading Homework in high school. At Literate Lives, Karen thinks about "What Does Reading Homework Look Like?" These teacher bloggers have all given us some important things to think about when it comes to home reading. Enjoy! For the past several years, Terry, at Scrub-a-Dub-Tub, has led the Kidlitosphere in a celebration of literacy in all its forms: Share a Story - Shape a Future. It's a grand pep rally for literacy that re-energizes us to continue in our efforts to raise another generation of readers, be they our own children, or the children in our classrooms, libraries or communities. It takes a village to raise a reader! We'll be hosting tomorrow's event -- Love of Reading vs. Homework. We've invited teacher-bloggers from around the Kidlitosphere to submit posts for this roundup, but we'd love to hear from you, too! If you'd like to post on this topic and be included in the roundup, leave your link in the comments and we'll include your thinking.